Kapil Sharma 2 April 1981 Indian Jeetendra Kumar Janak Rani Comedian, Actor Indian Stand-up Comedian, actor, TV host, producer and singer. He hosted a largely popular television comedy show 'Comedy Nights with kapil' from June 2013 to January 2016 and currently hosting 'The Kapil Sharma Show' on Sony Entertainment Television. 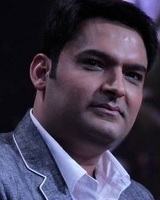 A list of popular Hindi Kapil Sharma quotes are given below.